Six Days in Cincinnati recounts the riots in 2001 that ignited the Black Lives Matter movement. The police-involved shooting of 19-year-old Timothy Thomas in April 2001, sparked days of riots and protests in Cincinnati, OH. 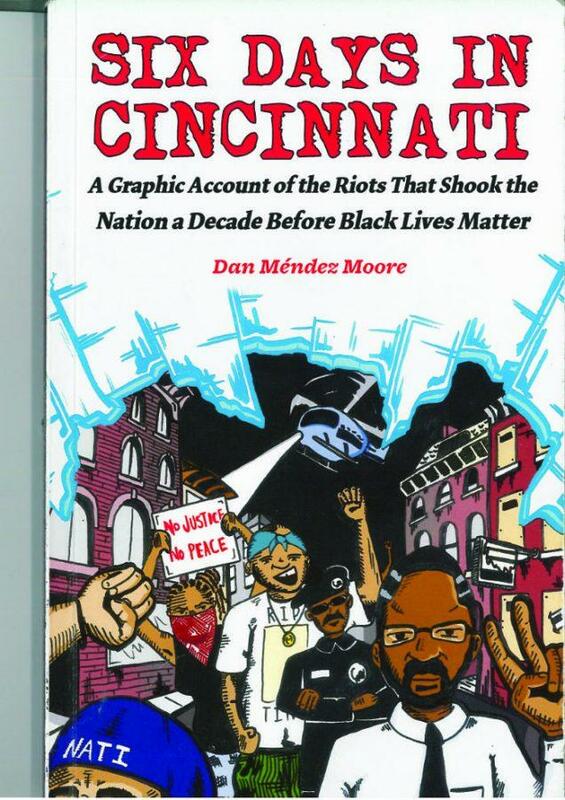 The riots occurred specifically in and around the predominantly poor black neighborhood of Over-The-Rhine. “Six Days in Cincinnati: A Graphic Account of the Riots that Shook the Nation a Decade Before Black Lives Matter” is a graphic-journalist account by Daniel Moore. The book tells the story of the days before and after the civil unrest that resulted from the shooting of Timothy Thomas. The book is pulled straight from the headlines of that fatal day, featuring a new personal testimony to map out each day. Moore mixes his own experience living in the area with these testimonies to create a comic that lays the foundation for the events of those six days. For those unfamiliar with the 2001 riots, the book can be hard to follow. This works to the book’s advantage. News surrounding police-involved shootings and subsequent protests can also be hard to follow. To the same end, the book references similar police-involved deaths which add to the convoluted nature of the book. I would recommend the book to anyone. It’s a great graphic representation of events leading up to the riots and a perfect example of some of the events that led to the formation of the Black Lives Matter movement. For me, the book was not my cup of tea, but it provides a learning tool and introduction for understanding and growth. Robin is a English major. Her minors include Child Advocacy and Teaching English as a Second/ Foreign Language. Sadly, before he discovered how to properly promote his #T_H_U_G_L_I_F_E Child Abuse *AWARENESS* concept, Tupac joined an increasing population of deceased Americans murdered by America’s Culture of African American Child Abuse, Neglect and Maltreatment.